This section outlines how tea originated in China and Japan. There are various legends surrounding the origins of tea. Perhaps the most famous is the Chinese story of Shen Nung, the emperor and renowned herbalist, who was boiling his drinking water when leaves from a nearby tea shrub blew into the cauldron. He tasted the resulting brew, and the beverage of tea was born. An alternative story claims that links tea drinking to the Indian prince Bodhidharma, who converted to Buddhism and in the sixth century and went to China to spread the word. He believed that it was necessary to stay awake constantly for meditation and prayer, and took to chewing leaves from the tea shrub, which acted as stimulant, helping him stay awake. (An alternative, more macabre version has Bodhidharma accidentally falling asleep, and upon waking cutting off his own eyelids in disgust at himself. He threw the eyelids away, and from them sprouted the first tea shrub). Part of the problem in pinpointing the origins of tea stems from the fact that the Chinese character t'u is used in early sources to describe infusions made from several different plants, not necessarily just tea. By the third century AD though a new character, ch'a, was developed to refer specifically to tea. Ch'a is very similar in its calligraphy to t'u, and its development suggests that tea had become such a popular drink that it needed its own character. The word ch'a is now sometimes used in English to refer to China tea. Tea was certainly known as a beverage in the time of Confucius (c.551-479 BC) and grew in popularity during the Han Dynasty (206 BC - 220 AD). By the time of the Tang Dynasty (618-906 AD) tea was the national drink of China, spreading from court circles to be popular throughout Chinese society. It was during this time that the practice developed of sending finest teas to the emperor's court as a tribute to him. At this time, it was manufactured in brick form: the tea leaves were pounded and pressed into a brick-shaped mold, then dried. To prepare the tea, part of the brick was ground down, and the result was boiled in water. Later, powdered tea was developed from green tea leaves. This gained popularity during the Sung Dynasty (960-1279 AD). Boiled water was poured onto the powder and left to brew, and the resulting liquid was whisked into a frothy tea. It was during this period that tea drinking became popular in Japan, reintroduced there by a Zen Buddhist monk who had been studying in China. So in Japan, it was the Sung method of preparing tea that took hold. In China, tea fell out of favour as a drink during the years of the Mongol Yuan Dynasty (1280-1368), when the Mongol rulers considered the drinking of tea a symbol of decadence. But it returned to popularity under the native Chinese Ming Dynasty (1368-1644). After years of foreign rule, this Dynasty saw a revival of all things considered quintessentially Chinese, and tea was certainly one of them. It was in this period that tea began to be brewed by steeping cured loose leaves in boiling water. Because it was at this time that the tea was first tried by Europeans, it was this method of making tea that became popular in the West, and remains so to this day. Also under the Ming Dynasty there was experimentation with different types of teas, fermented black teas, unfermented green teas, and the semi-fermented variety that it is now known as oolong, and within these categories with innumerable different varieties. But the variation in types of tea in China is not even half the story. The history of tea in China and Japan is bound up with its cultural significance.For tea was a drink that would take on literary, artistic and even religious overtones. This can be traced to the writing of a fascinating treatise on tea by a Chinese scholar called Lu Yu.By the time Lu Yu wrote the Ch'a Ching, The Classic of Tea, in the eighth century, tea was already a fairly common drink in China. But Lu Yu's work was the single most influential aspect in developing the cultural significance of tea. Little is known about the man himself, except that he was probably born in the second of the eighth century and died early in the ninth century. He was a scholar from Hupei Province in Ching Ling, an area of Southern China where the cultivation of tea was most widespread, and lived for a time in seclusion in Chekiang Province. It was during this time that one story claims he came to write the Ch'a Ching. According to this, he had been walking in the wilderness, chanting poetry until he was moved to tears. Returning home for some tea he was inspired to write the Ch'a Ching. 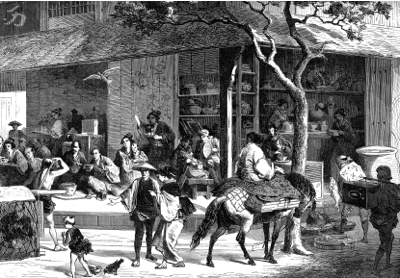 A more prosaic version of events suggests that the Ch'a Ching was in fact commissioned by a group of tea merchants, wanting to popularise the drink that was the basis of their livelihood. If this is the case, then it was a remarkably early - and remarkably successful - work of PR! The Ch'a Ching itself elevates the preparation and drinking of tea to near-religious status. Like a religious ceremony, there is a set ritual, using particular implements which are endowed with individual significance, and there are guidelines on the appropriate state of mind for the tea drinker, and the atmosphere in which tea should be drunk. This similarity to religious ritual is no coincidence; the Taoist faith was central to culture in eighth century China, and with it the belief that every detail of life was an act of living that was worthy of celebration, and that one should attempt to find beauty everywhere in the world. Thus the emphasis on tranquility and harmony in the preparation and drinking of tea was recognition of its part in the masterpiece of life. The Ch'a Ching begins with an explanation of the tea shrub and how it grows, and on the proper manufacture of tea, right down to the weather conditions when it should be picked (only ever on a clear day). Lu Yu next describes the implements needed for the preparation of tea - 24 in all, a number which would put even the most elaborate modern western tea service to shame! These range from the brazier and the cauldron for heating the water, to the roller needed to grind the solid bricks of tea, to the bowls from which the tea was drunk, to the container for carrying it all. Lu Yu gives advice on every aspect of these implements, and indeed the right equipment was so important to him that he states that if even one implement is missing, it is usually best to dispense with the tea altogether. Lu Yu then gives advice on the best sources of water for tea (mountain water from slow-flowing streams is best), the stages of boiling, and the correct method of drinking the finished beverage.After all the rigours of its preparation, it is no surprise that Lu Yu believes that tea must be sipped slowly in order to savour the flavour. He also states that to enjoy the tea at its best, the drinker should have no more that three cups, and five at the most. He also laments the practice of adulterating tea and lists some of the things added to it by his contemporaries. Some of these - ginger, orange peel and peppermint - are familiar to tea drinkers now, but Lu Yu also mentions the custom of adding onion to the boiling tea! In fact, the only adulterant of which Lu Yu approves would also now be considered very strange by western tea lovers - salt. The stringent rules of Lu Yu's tea making seem at odds with the modern western notion of a quick cuppa, but in some ways they are not so different. Lu Yu was concerned that tea should be made in an atmosphere of tranquility and the drinking of it should create still greater tranquility. Most modern British tea drinkers would agree that the familiar act of making tea can be calming at times of stress - and that the drink itself can enhance that feeling of tranquility. We may not need 24 implements, nor have to draw our water from mountain streams, but a nice cup of tea is still a good way to enjoy a moment's peace. Lu Yu's book was certainly influential in his homeland, China, but it was most avidly read in Japan.There it helped form the basis for the development of the Japanese Tea Ceremony (Cha-no-yu), a ritual that has raised the preparation and drinking of tea to an art form that still flourishes today. Tea was probably introduced to Japan in the eighth century by a Chinese priest, and for some years the practice of tea drinking remained the preserve of Buddhist priests. In 1191 a Zen Buddhist monk named Eisai arrived from studying in China bringing new seeds, and introduced the tea ceremony. The ceremony was based on the tea-drinking rituals of Zen Buddhist monks in China, who believed tea's properties as a stimulant were an aid to meditation. This started a revival in tea drinking, and Eisai went on to write the first Japanese book on tea, the Kitcha-Yojoki, or Book of Tea Sanitation. Gradually tea drinking became popular outside religious circles, and the Tea Ceremony came to be regarded as the quintessential expression of social sophistication and elegance.As with the tea preparation and drinking described by Lu Yu, the Ceremony is about much more than just making a hot beverage. The Taoist idea of trying to find beauty in the world was combined with the Zen Buddhist belief that the mundane and particular were of equal importance with the spiritual and universal. Thus the ritual of tea making expressed the quest of greatness in the smallest details of life, and the formalised acts of graciousness and politeness that are integral to the Ceremony are an outward form of an inner belief in the importance of peace and harmony. This did not happen overnight though, and early tea ceremonies in Japan were often quite boisterous affairs that could include gambling and the consumption of alcohol. But the ceremonies gradually became more and more refined, in large part due to the personalities and influences and three Tea Masters. The last of these, Sen No Rikyu (1522 - 1591), lived for much of his life in Kyoto, where he studied Zen. It was Rikyu who incorporated the essence of Zen into the Tea Ceremony, and it is in the form he developed the Way of Tea (chado) that is practised through the Tea Ceremony to this day. Rikyu himself became the personal Tea Master of the powerful political leader Hideyoshi and was his chief aide, but the close relationship between the two men broke down, perhaps because other men jealous of Rikyu conspired to turn Hideyoshi against him. Eventually Rikyu was obliged by Hideyoshi to commit ritual suicide (seppuku), a more honourable death than being executed. Despite this sad end, Rikyu's sons and grandsons continued to practice the Way of Tea. Today the Urasenke Tea tradition (the largest of the various different Ways of Tea) is headed by grandmaster Zabosai Sen Soshitsu XVI, the sixteenth generation of direct descendants of Riyku to hold this position. A very formal Ceremony, based on Rikyu's teachings, would take place in a specially built tea room (Sukiya) - usually a small wooden structure with a sloping roof, built with immense care. There is also an anteroom (midsuya) where the tea utensils and washed and arranged, a portico (machiai) where guests wait untilsummoned to the tea room, and a path through the garden (roji) which connects the two. 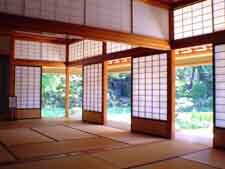 Inside, the tea room is simple and spare in design, in emulation of a Zen Buddhist monastery. The walk through the garden to the tea room is the first stage of meditation and breaks the connection with the outside world. Guests are expected to approach silently in order of precedence - samurai warriors were obliged to leave their swords on a rack outside - before bending to enter the tea room through a low door, an act intended to imbue the guests with a sense of humility. The guests then look at the ornaments and the flower arrangement and the tea caddy and kettle before taking their seats. The host then enters from the anteroom, makes a formal greeting, which is returned by the head guest, and proceeds to make the tea. The preparation and receiving of the tea is subject to numerous rituals and uses various different implements, and would doubtless meet with Lu Yu's approval! But not all ceremonies are so rigid. 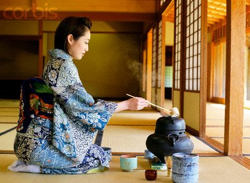 Tea is practised throughout Japan by people from all walks of life, who have usually learnt it a their local tea club. It is thus a very social activity, and one in which participation by the guests is crucial.Although some Ceremonies are held on special occasion and are very formal and private, others are open to anyone who would like to buy and ticket, and so they are often held as fund-raising or charity events. Nonetheless, there is still an emphasis on harmony, respect, purity and calm. Within its formality is the belief that rigidity and structure can in some senses be liberating and meditative - that freedom and beauty can be found within a strict form - which is at odds with the contemporary western notion that formalism can only restrict art. It should be remembered that the Tea Ceremony is as far removed from everyday methods of tea making in Japan as afternoon tea at the Ritz is from a cuppa from a flask on a construction site in England. It is more like the old-fashioned English tea party, with the hostess using the best china and serving the best snacks, and polite chit-chat being made. Even now though most tea lovers in Britain have their own rituals - the first cup of the day, the favourite mug, the method of stirring, tea first or milk first - which still illustrate the comfort and peace that can be found in the familiar act of making the perfect cup of tea. The Classic of Tea by Lu Yu, translated and introduced by Francis Ross Carpenter (New Jersey, 1974). Okakura Kakuzo, with introduction by Liza Dalby, The Book of Tea (first published 1906, new edition, Boston, 2000). Derek Maitland, 5000 Years of Tea (New York, 1982). A.L.Sadler, Cha-No-Yu, The Japanese Tea Ceremony, (First edition 1933, new edition, Vermont, 1962). Apart from tourism, tea is the biggest industrial activity in India.